Is It Ever Ok to Quit Homeschooling? I am a huge fan of homeschooling. Humongous, really. I love homeschooling, despite the hardness of it, the humor poked at it, and the heavy work load. And I have plenty of reasons why I homeschool. And why I don’t do public school. And even more benefits for homeschooling. Still, do I think everyone should homeschool? No. I don’t. I had a reader ask an heartfelt and somewhat controversial question on the Facebook page. She wanted me to address it here: Do you think it’s ever ok to quit homeschooling? Yes. And no. So… here are my thoughts on this question (not to be confused with the question “should you homeschool or not”, which is a different question), as I finish my sixteenth formal year of homeschooling. If your reasons for homeschooling are still intact and none of the other reasons listed above fit the bill, then I say it’s not appropriate to quit. 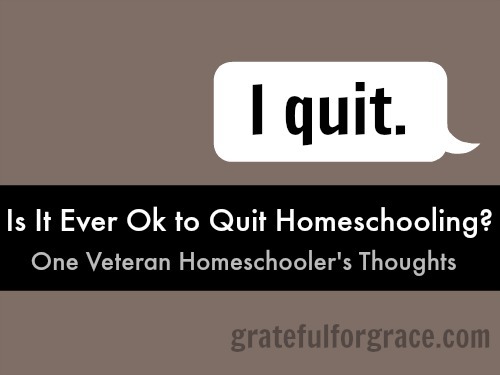 If your reasons for homeschooling no longer exist, then it makes sense that you would quit. Realizing this could be rather eye opening and helpful. This could mean that priorities have shifted, goals have been met, philosophy has changed, or other similar ways reasons disappear. The other causes I gave in the simple answer for ceasing to homeschool are pretty severe. Have I ever seen the above reasons affect a family? Yes, yes, I have. And the judgement against that family for not continuing to homeschool was shocking to me. No matter the reasons for us homeschooling, no matter how committed we are to the idea, we are not the only ones involved, as parents. There are students. And they affect the situation and climate in the home. Greatly. There are expenses. And they affect the situation and checking account in the home. Greatly. To stand on a line so stubbornly that we refuse to see reasons that could change that line for others, is to either make the line an idol or to make oneself unmerciful. Neither are God honoring. Homeschooling is wonderful. It is a gift we have in this country and I pray that it is always available, legally. It is not always an option for a family, though. Of course, I wish that was the case. But wishing something were true, doesn’t make it so. Nor does believing it is it the ideal. If you are one of the mamas who has had drastic changes to her life, to her children, and/ or to her finances, making it impossible or unwise to homeschool, accept my cyber hug. And encouragement that you must do what you must to do make yourself, your children, and your home safe and viable. May God give you wisdom, strength, perseverance, finances, and support as you navigate the new route on which God has taken you. If your reasons are intact and nothing drastic has changed, then I lovingly say that you need to not quit. Yes, it may be difficult in a major way for many reasons. Yes, you may need to make some big changes. What could those be? Quitting anything should be not be taken lightly, but quitting a lifestyle that is usually connected to educational, spiritual, and familial philosophies for sure should be taken seriously. We always need to consider our heart attitude for quitting something. Always. Homeschooling is no different. Does that mean we never quit? No, it doesn’t. It just means it must be done for only the right reasons. What reasons would you add to the yes list?